You have heard right Nebolish do not have a drool/slobber problem! Making them a great indoor friend. Nebolish were bred to Improve the health of other Mastiffs and are very healthy, they have not been plagued with many ailments, but we still check. who wants champion background and unhealthy puppies! Not all predictions come true and you must do your part to be a good parent! Training, you can mold your puppies temperament! problems is poor guidance from there owners. Be certain you understand he wants to be a member of your family, teach him what is acceptable behavior in your home. You need visits to the vet, exercise and good quality food! Ask questions, if your having troubles do not assume its normal puppy behavior, its likely a behavior your causing. There are many ways to raise a puppy, what you let him do at 20lbs he will do at 150 lbs. You must be a good role model. 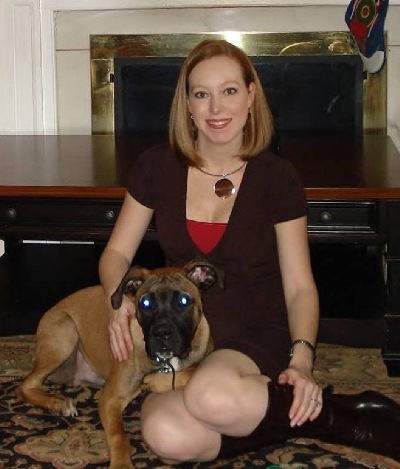 Many opinions on what works, and a good trainer knows not every method works for every puppy. Early Training is essential for a best friend! thru generations of healthy dogs. Which is better than any test known to man. We do not knowingly breed animals affected with any disease. to be included in a breeding program. (Pedigree) which helps keep it out of our line. When your puppy lives a good healthy life, we have completed our mission. This is our goal providing wonderful friends for life. We think they are beautiful in ALL colors! Demodectic Mange, Tendency to be allergic or sensitive. I'm certain you have read there are so many issues with some bloodlines. I want you to feel comfortable in getting one of my babies, understand what we breed for and why. Recently our Sires were submitted into the American Kennel Club DNA Certification Program. This according to AKC, is a way for breeders to strengthen there breeding programs. Each Genotype for each dog is unique, like a fingerprint. 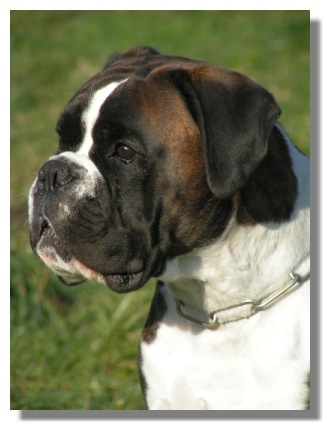 This is done in an effort to improve our genetics, and possibly detect any heritable conditions in our breeding Boxers. Puppies will have DNA information printed on AKC Registrations. Tank is the result of good DNA, you can see his Genetic Makeup is outstanding. We work hard to plan our breedings, considering the good and bad traits in each parent, by making the right breeding choices you improve your bloodline. Tank is of course the apple of his owners eye. A Pedigree is much more than Name dropping and flaunting "Champion Lines". Knowing the health history of close relatives allow a good breeder to avoid pattern illness and early death. Each breeders goal should be to improve the breed, not cut corners to make money. We are interested in there intelligence, working ability. You improve the breed when you carefully plan a breeding. We breed for Temperament, training ability and then looks! a pet with a long and active life ahead. Our puppies are to the best of our knowledge, Healthy and genetically sound. We guarantee this by giving a written Vet health check guarantee. All pups have there first set of shots, are wormed, dewclaws are done. We start them right, socialize and raise them indoors. We are proud of our babies. They are started right so we can guarantee them! Boxer ears are up to the new owner, if your in the Houston area we can refer you to a vet who does an excellent crop. Remember the longer the cut the more pain and hassle your puppy has to endure. It is a big decision there is always the risk of them not standing. They are cute left natural, there is no reason to crop a Boxers ears its purely cosmetic, and personal choice. Nebolish Mastiffs, NEVER have ears cropped, we prefer the tail cropped, but this is up to you. 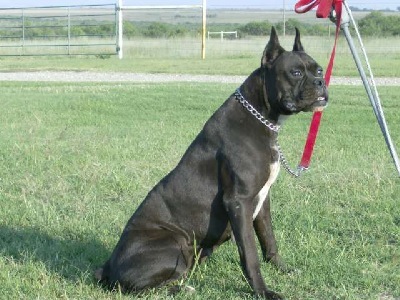 Boxer tails are cropped at birth. We try to show you both looks. Black female bred to Duke for July Litter! that are active and intelligent from Birth to 13 years old. This is, to us, much more important than a hundred "Champions" in there background, and should be to you too! If Only Healthy "Show dogs" are bred, how do such heart,cancer,hip,and nervous problems keep occurring? trouble and breeding for "Potential Champions"
After spending $Thousands of dollars and hours to produce a "Champion"
if he shows signs of heart trouble, or his Sire dies of Cancer, do they just Neuter him??? If the dog will produce a litter with a show dog in it they breed him anyway. Have you ever seen this happen? This is our opinion and not ment to offend the responsible Show person, but we all know it happens! Genetics do not lie! If you have altered a "Champion" due to a health condition I would LOVE to hear about it!! 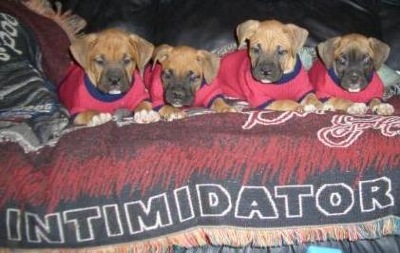 Many Boxers are looking for a home or sent to rescue who did not make the "Show Cut". Owners More concerned with Champion lines, perfect ears, or Markings than Brains or Temperment. Many lines you can forget working ability. Boxers were the FIRST Police dog, they had brains, we Breed for this. Never heard of a "Champion" Neutered due to a bad heart or Cancer in his line. We want people who are looking for a good healthy new addition to there family. This is why I do not promote Show dogs!! Not to say that some of our pups have went into the show ring and done quite well. We have both Champion and Working titles in our bloodlines, but we prefer health and longevity as our primary focus for our babies, All are perfect to love! Your puppy is sold and priced as a pet only! Not as a breeding dog unless expressly determined. Your not wanting a Breeding animal, your puppy is sold with Limited registration, do the best for your puppy and spay or neuter. I do not like to alter puppy too soon...We are not encouraging the recent trend to spay at a early age, it does not (my opinion) give your puppy a chance to develop emotionally. 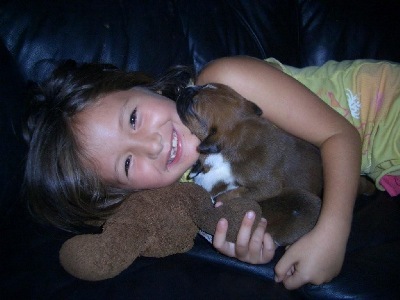 Train your puppy for years of enjoyment, start EARLY go to class at 14weeks! I am happy to help find a great trainer near you. Consider everything BEFORE you breed! Never just do it to try to make your money back, It does not happen if puppies are raised correctly! What if puppies or mother dies, children will be devastated! Can you spend hours a day with the litter, this is a must! No Vacations or days away, what to do with 8 puppies? Must be fed 4 times a day...it is alot of work. wanting a good dog for your bloodline. this is just responsible breeding ethics! Ask your vet all the benefits of Spaying and Neutering..
Add years of life to your dog Reduce health problems significantly! focus on you and family,there temperament more even and happy. Makes them a better family member! These Are reasons constantly given. 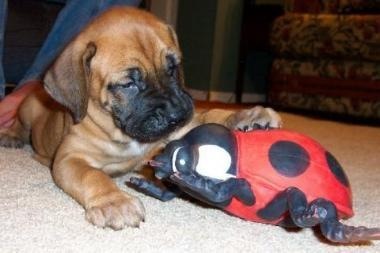 Please Contact: Please email us, we love to talk Boxers and Mastiffs! We Love matching People and Puppies! Our pups are worth waiting for!! with a wonderful Personality plus. Started right, ready to be members of your family. Please see more babies other page! All Pups are registered, and come with a Written Health Guarantee. by photo's, sent via mail or e-mail. This is a common way to get a puppy in this day and age. When its time to pickup, we prefer to meet our new puppy owners, for pickup, or I often use air nanny, which delivers puppy directly to you at your nearest airport, this is the least stress on our babies...shipping by air is as safe as you flying. Be assured our babies come pre-spoiled! We realize this is a big decision to make with out actually seeing the puppy until they arrive or you pick up, please ask questions, let us know if there is anything you need to know! We are happy to temperament test potential puppies and give you accurate early stage development, and tell you our opinion on a puppy. It is Important that you tell us what you expect and are looking for in your Boxer or Nebolish. Its our goal to match the right puppy with your family. We are happy to help you find that new addition! You decide Which baby of the litter will be yours! expensive BUT safe arrival is always our primary concern. You get an exact all inclusive cost, No hidden costs. This has been our Hobby over 25 years Its really a labor of Love. Puppies are fun,New puppy families are great! We love matching people and puppies. Cleveland...We handle it all ourselves. Less stress Simple process. Planning Litter due soon! Email for info babies looking for families..
Once born they go very Quickly. Accepting advanced Bookings NOW for our next litter, be sure your on our list! Email for cost information, AKC Boxer Pups and CPR Nebolish Mastiff babies are placed at a very reasonable adoption fee, main concern is for families to own, a nice Healthy, happy companion. We are happy to put you on our list. We own several generations, not just 2 dogs we got and bred together. The puppies come from a long line of Large, Muscular, Intelligent Dogs. Highly Trainable, with great drive for pet or Working ability. Please Email for more information, we love to talk Boxers and Mastiffs!! This Box not working, please go to contact us page!